Ten years ago today, the Indian Ocean tsunami roared across more than 3,000 miles and a dozen countries from Southeast Asia to Africa, killing 200,000 people and leaving 40,000 missing. I remember watching the news from my parents’ kitchen, in the aftermath of Christmas, as hour by hour the enormity of the disaster registered on the world. And it was Aceh, a conflict affected province of Indonesia, that suffered the greatest impact, accounting for nearly half of the total casualties. Eight days later, I was in Aceh. I will never forget the surreal sights and stench of such massive destruction. In a humid heat, bodies were still trapped beneath towers of debris and piled along the road. Boats were in trees and houses were upended. Survivors and humanitarian workers alike had a dazed look. In the face of this utter tragedy, the world mobilized to save lives and reconstruct. The tsunami generated an unprecedented outpouring of support from the international community. Indonesia received more than $7 billion in aid, the most generous response ever to a natural disaster. In three years, Indonesia built new airports, roads, schools, and over 130,000 new homes. USAID was front and center in the response, deploying a multi-country Disaster Assistance Response Team to the most affected areas immediately following the tsunami. USAID’s Office of U.S. Foreign Disaster Assistance and Food for Peace provided more than $96 million in emergency support in the form of food, shelter, water, sanitation, and medical supplies. In the immediate aftermath USAID airlifted 20,000 kitchen sets, 20,000 mosquito nets, 8,400 ten-liter water containers, 2,000 hygiene kits, 230 rolls of plastic sheeting, and two 12,000-liter water bladders. Partners built or rehabilitated more than 1,600 water systems in villages throughout Aceh, benefitting more than 77,000 people. Repaired sewages systems and sanitation facilities improved hygiene conditions for over 90,000 people. In the years that followed, USAID has continued to work alongside survivors to help affected communities rebuild and create jobs. 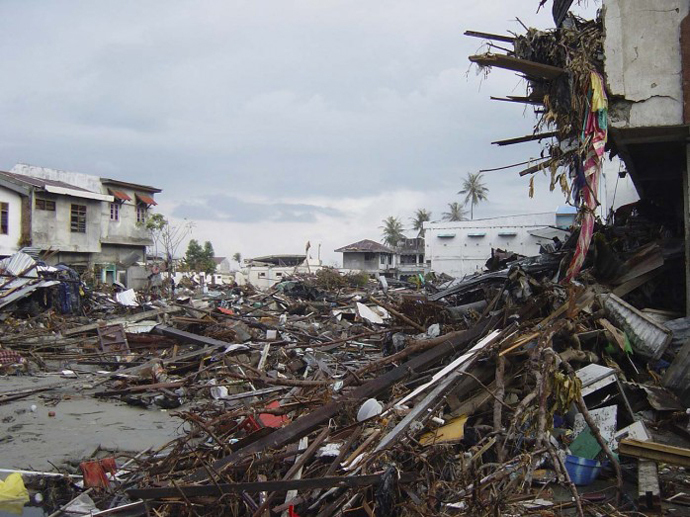 Although there was a lag of several hours between the earthquake and the tsunami, almost all of the victims of the Indian Ocean tsunami were taken by surprise, because there were no early detection or early warning systems in place. 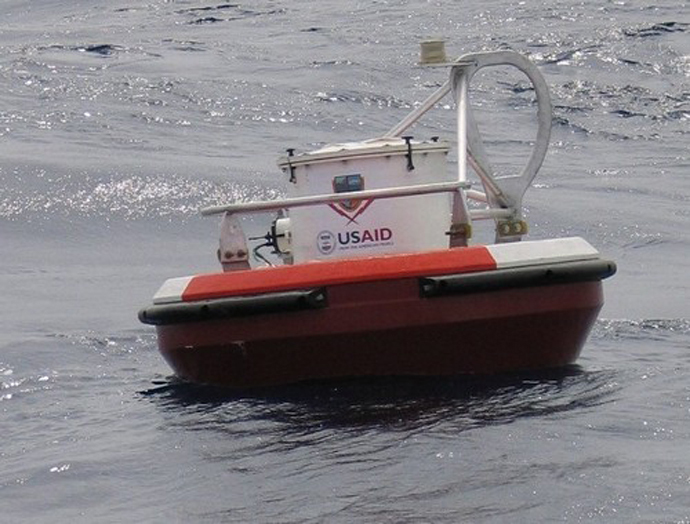 In the aftermath of the tsunami, USAID provided $16.6 million to support the development of the Indian Ocean Tsunami Warning System (IOTWS), an integrated early warning and mitigation system that allows countries in the Indian Ocean region to detect and prepare for tsunamis and other coastal hazards. When the Banda Aceh earthquake struck in 2012, the IOTWS system successfully alerted communities across the Indian Ocean and millions of people were able to move away from the coastline. As a result of these and other early warning efforts, countries and communities, USAID and its development partners are better prepared to respond and mitigate the impact of disasters before they strike. More than 15,000 U.S. soldiers participated in Operation Unified Assistance, the U.S. military’s response to the Indian Ocean tsunami. Without the unique strategic and tactical lift capabilities of the military, we would not have reached remote places with life-saving supplies as quickly. Yet, civil-military coordination was a major challenge, with 17 militaries and hundreds of international NGOs responding. Over the past decade, UN agencies, donors, relief organizations, and the U.S. and other militaries have learned to coordinate more effectively on disaster responses, from the 2010 earthquake in Haiti to last year’s typhoon in the Philippines. USAID’s Office of Foreign Disaster Assistance is the designated U.S. government lead agency in disasters and has worked closely with the military and other U.S. government agencies to create a more seamless system for calling forward needed capabilities. In the current Ebola crisis, USAID and the U.S. military are working hand in glove to sustain an agile and effective response to one of the most complex emergencies of our time. In Indonesia, the 2004 tsunami completely razed coastal towns like Banda Aceh, but left others further from the shore untouched. The massive outpouring of aid in the aftermath of the tsunami provided life-saving relief to devastated communities, but also threatened to create a second crisis by smothering local markets that remained active across the country. The tsunami helped catalyze a greater understanding of the power of pivoting quickly from delivering commodities to a focus on using cash for work and other strategies to revive local markets. USAID supported cash-for-work recovery projects that employed 70,000 people, and helped finance the construction of 278 fishing boats to revive Aceh’s fishing industry. In partnership with Chevron, USAID also developed and hosted three-month vocational courses for hundreds of young people in Aceh, like Junaidi and Syahrizal (pictured above). In the decade since the tsunami, the humanitarian community has increasingly recognized the value of cash-based approaches to emergency responses. USAID has continued to be a trailblazer in these efforts, using mobile e-payments and harnessing public-private partnerships to help jumpstart economies after a crisis, including in the aftermath of Typhoon Haiyan. The Indian Ocean tsunami caused massive social upheaval, uprooting the lives and livelihoods of hundreds of thousands of people. Sinhalese and Tamil communities came together in Sri Lanka around the common enemy of a natural disaster. In Sri Lanka, I saw an Office of Transition Initiatives program that brought together Sinhalese and Tamil youth to work side by side to clean the debris and rebuild their communities. And, recognizing that their own people needed to rebuild not fight, the Free Aceh movement signed a peace deal with the Indonesian government in August 2005. Indonesia’s experience sparks important lessons for how— if given the right circumstances and leaders willing to put their people first— disaster response can catalyze opportunities for peace and inclusive governance. Most importantly, we know that tsunamis, typhoons, droughts and other shocks will continue to batter communities, hitting the most vulnerable the hardest. Since 2011, USAID has been at the forefront of a global conversation on building resilience. We know that all our development gains can be wiped out in an instance if households, communities, countries and regions are not better able to adapt, prepare, and recover from the shocks we know will continue to occur. That is why in partnership with the Rockefeller Foundation and Swedish sida, we launched the Global Resilience Partnership, which will drive evidence-based investments and innovations that enable cities, communities, and households to better manage and adapt to inevitable shocks. Watch Stories of Recovery: Ten Years After the Tsunami, a short film by Jolyon Hoff about Aceh 10 years after the tsunami. View an excerpt of the Build Back Better exhibition. Learn how USAID’s Disaster Management Program is helping Indonesia, one of the most disaster-prone countries in the world, better mitigate and respond to disasters.